Marc Graham was presented with his award by The Stage editor, Natasha Tripney. Photo: Wullie Marr. Middle Child are immensely proud to announce that company member Marc Graham has become the first winner of The Stage Edinburgh Awards 2017 for his performance in All We Ever Wanted Was Everything. The play, a gig theatre epic written by Luke Barnes with original live music by James Frewer, is running at the Roundabout in Summerhall until 27 August 2017. It is the first prize to be given out in The Stage’s awards at the Fringe, which are chosen by the publication’s team of Edinburgh critics and announced every Monday throughout the festival. 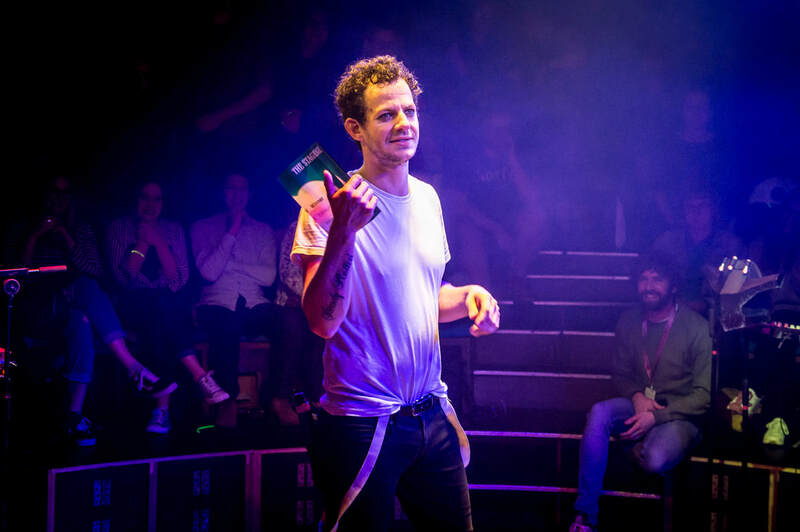 The Stage critic Fergus Morgan described Graham as “a mercurial MC who finds humour, hope, tragedy and truth in Luke Barnes’ poetic, political story”. Alongside the MC narrator role Marc also plays the unambitious Tom and eight year old Colin, as well as singing and playing acoustic and electric guitars throughout the show. The show continues at the Roundabout every evening (except Tuesdays) at 8.45pm.